Beans don’t always get the credit they deserve. Most Americans grow up with the heavily salted cannellini, garbanzo, and kidney beans that make their way from cans into many a three-bean salad, but freshly harvested shelling beans are another game. The time to enjoy them is late summer and early fall at the farmers market, where they’re available in myriad sizes and colors, ripe for hearty bean salads, soups, spreads, and sides. In addition to having a more robust flavor, fresh beans can be cooked in a third of the time it takes to cook dry beans, with no need for soaking. “I’m surprised that more vegetarians don’t tear our booth down to get them when they’re fresh,” says Louis’s son, Mike. Widely known as the “poor man’s meat,” legumes (a group that includes beans, peas, lentils, and other edible seeds) are a low-cost protein source, but the nickname undersells their delicious potential, wide variety, and low environmental impact. Beans have been cultivated for centuries around the world, starting with the ancient fava bean. The commonly eaten pinto, black, and navy beans are just the tip of the iceberg: today the world’s gene banks hold about 40,000 varieties. At Iacopi Farms, Louis and Mike grow varieties like fava, Gigante, Manchurian, and cranberry (and the related Borlotti), which they sell both fresh and dried, in addition to green beans like Blue Lake and Romano (which are eaten pod and all) and peas (both sugar snaps and the English shelling variety). These legumes feed the soil for the artichokes and greens that the farm also brings to market. Louis’s parents emigrated from Italy to the United States in the late 1930s and settled in Pescadero, where they started growing beans in their garden. “I grew up with beans, as long as I can remember,” says Louis. Some 70 years later, three generations of Iacopis are planting the same heirloom beans Louis’s father brought from the old country. The four-year drought has made for a lighter bean crop than usual this year. While inland farmers irrigate their beans, Iacopi Farms practices dry-farming, relying on spring rains to water their fields, including one plot off of Highway 1 at the Half Moon Bay Airport, where their beans grow between the runway strips. “We have a shortage of groundwater on the coast, but we also have cooler nights, fog, and a little bit of dew at nighttime, so the beans seem to manage okay,” says Louis. In the fall, the mature beans dry in the fields to be harvested before the winter rains start. The pods must be so dry that they crumble in your hand, allowing the beans to fall out. The pods are picked up by a harvester, threshed and cleaned to remove the pods and debris, dried for storage, and sold at farmers markets. When choosing fresh shelling beans, the prettiest pods aren’t necessarily the best. For red beans like cranberries, perfectly plump pods often yield a beautiful bean, but for butter beans (one of Iacopi’s most popular), the dryer, uglier pods often contain the ripest rewards. Removing beans from their shells takes a bit of patience, but the benefits are in the reduced cooking time and vibrant flavors. As with shelling a pea, you’ll find your technique and rhythm. “Just pop them open, and throw them in a pot and boil,” says Mike. Leaving the beans out to dry for a few days speeds up the shelling process. Nopa chef Laurence Jossel is a big fan of beans both fresh and dry, which he uses in soups and baked dishes or refried. For over nine years, he’s used Iacopi’s plump, white Gigantes (literally Greek for “giant”) in the restaurant’s signature dish: wood-oven-baked beans in tomato sauce, feta, and oregano pesto, with toasted breadcrumbs on top. Louis recommends simple dishes like the Italian minestrones and salads he grew up with. Simply boil the beans for 30 minutes until soft (never al dente), then add some olive oil, wine vinegar, and chopped onion, possibly some cooked tuna. You can also simmer them with some tomato sauce, sausage, bell pepper, onion, and a little garlic. Simple is best when the beans are as fresh as can be. 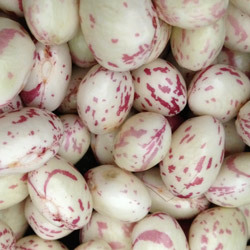 Find Iacopi Farms at the Ferry Plaza Farmers Market on Saturdays and Tuesdays. For a list of farmers who grow shelling beans, visit the CUESA website.